Up until now, there has been three anti-histamine nasal sprays in the United States market available only by prescription... Astelin, Astepro, and Patanase. 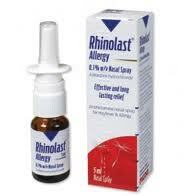 However, in May 2011, Meda Pharma announced a new anti-histamine nasal spray Rhinolast Allergy that is available over-the-counter. The active ingredient is azelastine, the same one as found in the prescription nasal spray Astelin and Astepro. Azelastine has a triple mode of action: anti-histamine effect, m,ast-cell stabilizing effect, and anti-inflammatory effect. Azelastine has a rapid onset of action of 15 minutes. It can be used from the age of 5 years. This nasal spray can be used in combination with other over-the-counter anti-histamines medications taken orally like zyrtec, claritin, allegra, and benadryl. Read more about this new nasal spray here. Read more about allergy medications in general here. I have never seen this medicine on the shelves of any store. The OTC version must have been recalled. In the US it is only available by Rx. I believe it comes OTC in Britain.